Wow! What a life this guy must have had. A life lived on-screen for over half a century! It’s kind of hard to believe he was a dramatic actor way back in the 1950’s. Who knew that he would later become the face of slapstick comedy! Canadian actor Leslie Nielsen, who went from drama to inspired bumbling as a hapless doctor in Airplane! and the accident-prone detective Frank Drebin in the Naked Gun comedies, has died. He was 84. 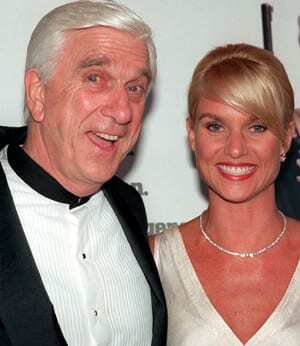 Canadian actor Leslie Nielsen, seen in this 1996 photo with Nicollette Sheridan at the premiere of Spy Hard, died Sunday at age 84. (Michael Caulfield/Associated Press)His agent, John Kelly, said Nielsen died Sunday at a hospital near his home in Fort Lauderdale, Fla., where he was being treated for pneumonia. Nielsen, who was born in Regina, went to Hollywood in the mid-1950s after performing in 150 live television dramas in New York. With a craggily handsome face, blond hair and 6-foot-2 height, he seemed ideal for a movie leading man. Nielsen was in more than 100 films, including the 2002 film Men With Brooms, co-starring Paul Gross. In recent years, he appeared on the Canadian TV series Robson Arms. He had stars on both Hollywood’s and Canada’s Walk of Fame and was named an Officer of the Order of Canada in 2002. Previous PostPrevious This Class Would Make University Fun!